Beauty 10 year old Quarter Pony mare - suffers from EMS (equine metabolic syndrome). Chronically foundered in all four hooves over at least 4 years. 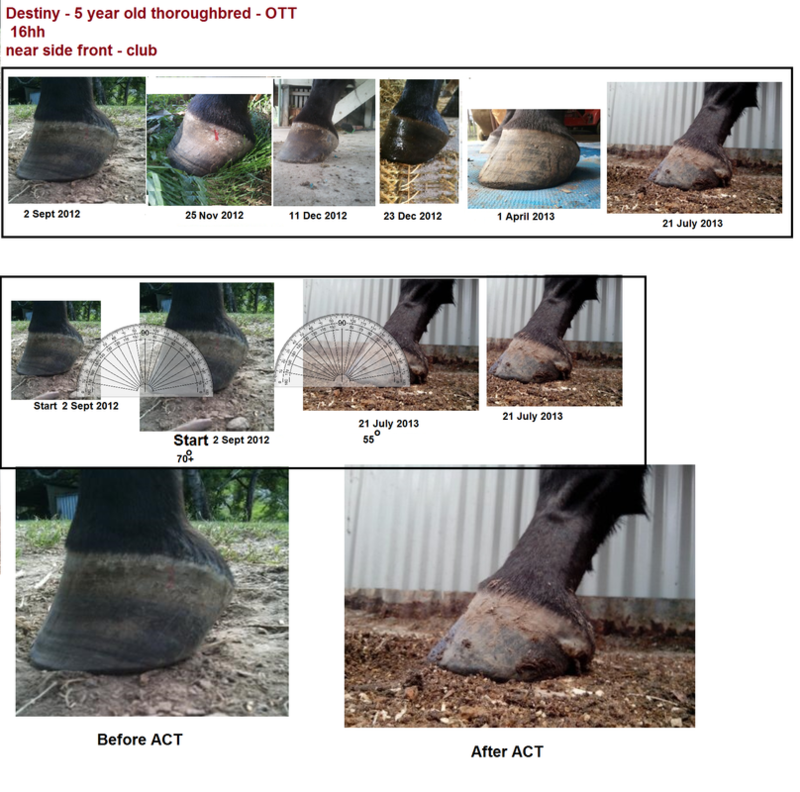 Treated with correct anatomical ACT trimming strategy (created by Linda J Harris, now improved and called TACT), first with boots, pads and casts with very good results growing in a new hoof capsule and thicker sole. This took two years because while she was recovering from the founder, we were still making mistakes with her EMS and the special diet she required. We knew the mare could not eat a lot of water soluble carbohydrates/sugars without it causing havoc with her hooves, but we didn't know that certain other feeds were taboo. ie. anything that raised her oestrogens would cause the mare to founder - again. So we learned that soy products & copra (raise oestrogens), haylage causes a fermentation type reaction in the hindgut and that effects the hooves negatively etc. Then there were the times that the pony broke into the feed containers (like a vacuum cleaner on legs) and when she escaped from the paddock (power not turned back on to electric fence) which permitted the highly intelligent pony to freely graze the sugary spring grass instead of being in her dry paddock eating her Rhodes grass hay). Then there were the grazing muzzles that the mare learned very easily how to remove by laying down and doing a few Houdini moves, dismissing the muzzles in minutes. In emergencies like these, we learned how to react quickly to the threat of another episode of founder. While the mare was not sound on hard ground or gravel while barefoot, she was able to walk well on soft ground/grass even while she was unshod, but after fitting Epona shoes on the front hooves only, the mare was able to be ridden normally without any hint of pain or tenderness. After a couple of months, the mare was active and pain-free and grew a heap of sole in the process of having fun. The Eponas permit the mare to get the circulation and movement she needs to build thicker sole and a solid, well attached hoof wall. This pony has Secretariat in her ancestry and she is FAST when she gets her Eponas on. The mare eventually developed gravel crushing hooves and was able to be ridden on all types of terrain without Eponas. She was a real pocket rocket and she loved to run. This mare's success story is one reason that we actively promote Epona shoes as a valuable aid that can be used to help address various types of lameness in horses. Since these two horses' hooves were rehabbed, Linda J Harris has continued to further develop ACT and it is now called TACT. (The Anatomically Correct Trim) Linda has discovered the iimportance of leaving the hoof buttress intact. Due to the erroneous 'research' made famous by Dr Hiltrud Strasser (http://www.strasserhoofcare.org/reading.html), Dr Chris Pollitt (https://hoofcare.blogspot.com/2013/03/chris-pollitt-brian-hampson-brumby-wild-horse-Australia-hoof-research.html) and others, most bare-foot trimmers and farriers deform the normal hoof by removing the heel buttresses from the hoof in order to supposedly 'keep P3, the coffin bone, parallel to the ground. Keeping P3 parallel to the ground is a fallacy anyway and does not occur in the normal foot as the anatomical reseach clearly reveals. Linda's research with many, many cadavar hooves have established that P3 is slightly elevated in the rear of the hoof when supported correctly by the heel buttresses. The heel buttresses being removed, permit P3 to fall toward the ground assuming a parallel or even negative palmar angle. The barefoot trimmers, vets and farriers who advocate the P3 parallel to the ground position were misled when they put the isolated P3 bone from a cadavar hoof onto a flat surfaced table, instead of seeing the position inside the hoof capsule of a healthy, sound-footed horse. The heels on the club-footed OTTB that we rehabbed, were, in light of the new information, taken down too low to represent a 'normal' hoof, but it was thie action of taking down the hoods too far that forced the back of the foot under and down at the rear of the foot. The inner foot was able to escape the constricted, club foot hoof capsule. 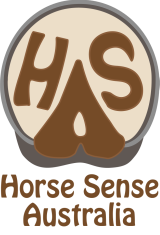 In order to maintain the hoof in the correct shape, heel must NEVER be taken down lower than 1" from coronary band to the tip of the rear hoof wall.